Kris Kringle, Father Christmas, Santa Claus; a jolly old elf by any other name still brings cheer to all. You better watch out, you better not cry! Santa Claus is coming to Stockton! Santa represents love, laughter, and giving at Christmastime. But where is the best place to see Santa in Stockton, California? He stays awfully busy during the holiday season, so we thought it would be useful to compile a list of places to find Ol' Saint Nick around town. Here is a list of places where you can track him down and take the kids this holiday season. Join over 25 Miracle Mile merchants as they host their Annual Holiday Open House on November 29, accompanied by photos with Jolly Ol' Saint Nick, a Tree Lighting Ceremony on Tuxedo Court, an unveiling of a new Miracle Mile Mural on Adams Street, and many other festive activities and live music. Learn more. Want to see Santa ride alongside a fleet of fire trucks? Then head on over to Weber Point Events Center on December 1 for the annual Holiday Tree Lighting Ceremony. Both Frosty the Snowman and Santa will make their grand entrance atop the holiday fire truck! New this year, combine with Tree Lighting Ceremony, the Holiday Stockmarket will offer a curated selection of specialty vendors from vintage clothing and decor to unique jewelry and original art. Learn more. Take the kids to see Santa Claus at this festive one-night only event inside the Stockton Marina on December 1st. Bright Night at the Stockton Marina will feature a free Santa's Playground filled with live music, face painting, games, a bounce house, and even an opportunity to say hello to Santa! Learn more. The Haggin Museum will transform into a Christmas wonderland on December 2nd, complete with imaginatively decorated trees, sleighs, festive floral arrangements, and the kids enjoy the opportunity to have cookies and milk with Jolly Old Saint Nicholas! Learn more. Santa will likely visit every shopping mall in Stockton this year, as he does every year. 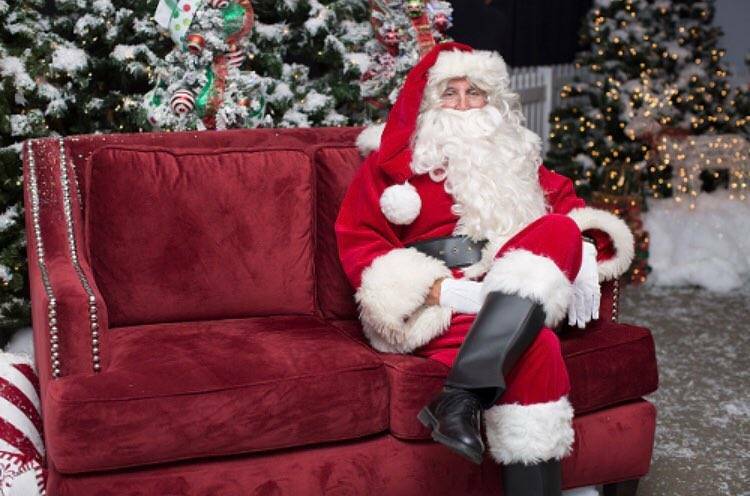 Santa makes special appearances during the holiday season at Sherwood and Weberstown Malls. Santa Claus will be available to greet children ready to share their holiday wishes, and you can't forget pets! Magical things are happening at Lincoln Center this holiday season. Santa makes appearances every weekend and the entire week leading up to Christmas. Take a train ride or carriage ride, see the famous Snow Village, and see the man in red located at the Center's Brickwalk. There is plenty of holiday cheer (and unique shopping opportunities) at Lincoln Center! See his schedule. Winter fun awaits at Dell'Osso Family Farm. There is no need to drive to the mountains to experience snow tubing, ice skating and photos with Santa. Zip over to this page for more info.